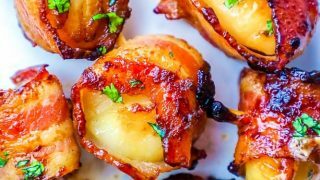 Brown Sugar Bacon Wrapped Scallops Recipe is perfect for a party, easy dinner, appetizer, or BBQ – these brown sugar glazed scallops wrapped in bacon is the most delicious bacon wrapped scallop recipe ever! 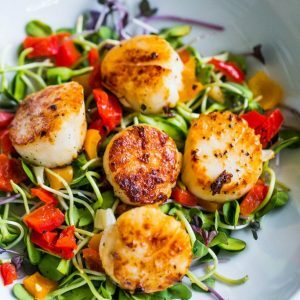 I love delicious, sweet, salty, and springy scallops – they are hands-down on of my all time favorite foods. Scallops are amazing with very little work – though they can be a bit tricky if you’re just learning to cook them. 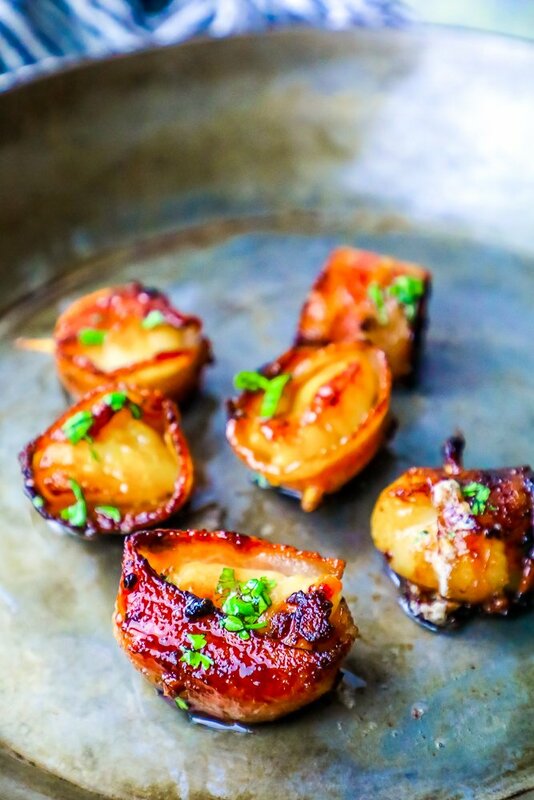 Luckily, I’m adding a ton of easy tips and tricks to make these amazing bacon wrapped scallops in a brown sugar glaze – so you don’t need any experience in the kitchen for a restaurant quality scallop dish! 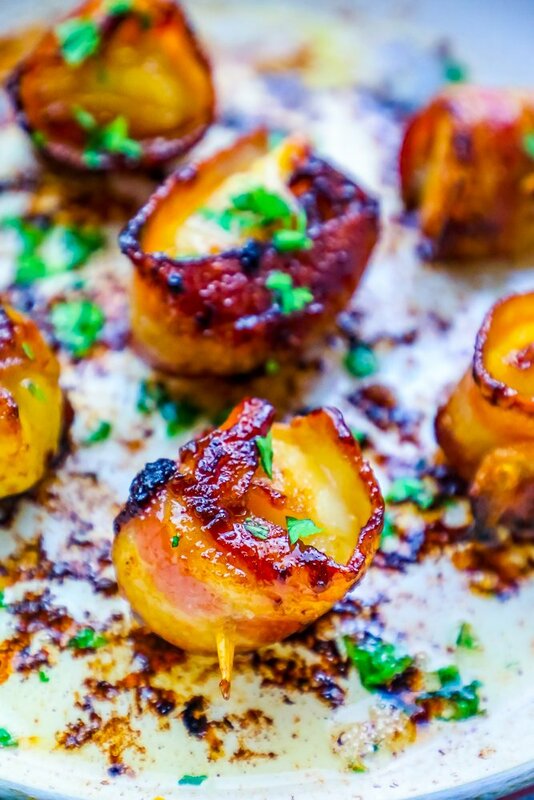 Just Take Me To The Best Brown Sugar Bacon Wrapped Scallops Recipe Already! 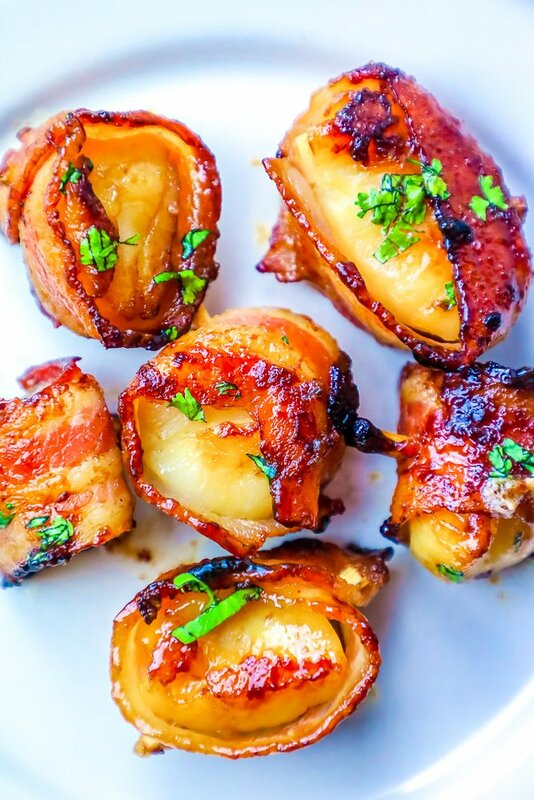 If you’d like to skip my helpful tips and tricks and get straight to the best brown sugar bacon wrapped scallops recipe, please scroll to the bottom of the page, just above the comments, where you will find the easy printable recipe. I get a lot of questions and requests for similar recipes on my posts, so I try to provide as much information as possible. Despite having the freshest scallops, it still can be very easy to mess them up – which actually makes any fishy flavor stronger! These simple easy tips will help you get perfect scallops, every time! 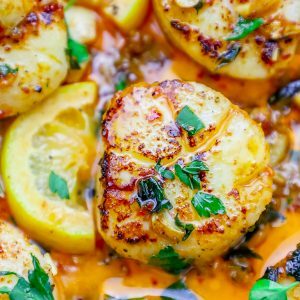 Scallops taste best with a little bit of charring from the pan – and starting with scallops that aren’t super wet are a great way to be sure you’ll have a crisp, crunchy crust on the outside of your scallop – giving it the perfect flavor! Use plenty of fat – oil or butter. Scallops can stick like nobody’s business – so I am always sure to use a little butter (I prefer the buttery flavor with sweet scallop meat) when cooking scallops – you could use the bacon grease from pre-cooking your bacon, but I prefer a bit of butter to avoid being too bacon-y. Scallops get very tough when cooked slowly or too long – for the most flavorful scallop meat, cook them hot, and quickly. For bacon wrapped scallops, I think pre-cooking bacon part of the way is essential for the best scallops that aren’t tough – and bacon that is evenly rendered. Don’t overcook scallops – not only do overcooked scallops taste fishy – they are often tough and hard to chew, too. For perfect scallops, brown each side, and watch the middle of the scallop. When the scallop turns bright white and opaque it is cooked. 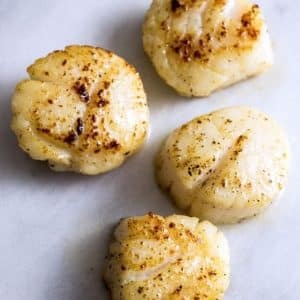 If you live somewhere you can’t get fresh scallops (like me in Northern Colorado), never fear – you can still grab frozen scallops and have a delicious dish – if you let the scallops defrost properly. These tips will help you maximize your flavor when cooking previously frozen scallops. -Set scallops on a dish, on top of paper towels. -Cover defrosting scallops with another paper towel and set in fridge for 12-24 hours, until scallops look jiggly and are soft to the touch, not frozen. Bacon is one of the most hands-down delicious things on earth – but bacon that is soggy, limp, and hasn’t been rendered is not good – but getting bacon cooked perfectly without drying out scallops can be a bit tricky! Bacon browns and crisps up at a much slower pace than what it takes to cook scallops, which need to be cooked very hot and very fast to keep their clean, sweet flavor and springy soft texture. To combat this, I pre-cook my bacon – so it is browned, but still pliable and soft. I like to think of cooking the bacon to 3/4 the way cooked – so it will just need to crisp up as your scallops cook. After I pre-brown some bacon, I will then wrap it around the scallop and secure it with a toothpick. The bacon isn’t done yet, but this will dramatically reduce cook time so you’re not forced to dry out your scallops which will give them a fishier flavor and tough texture. 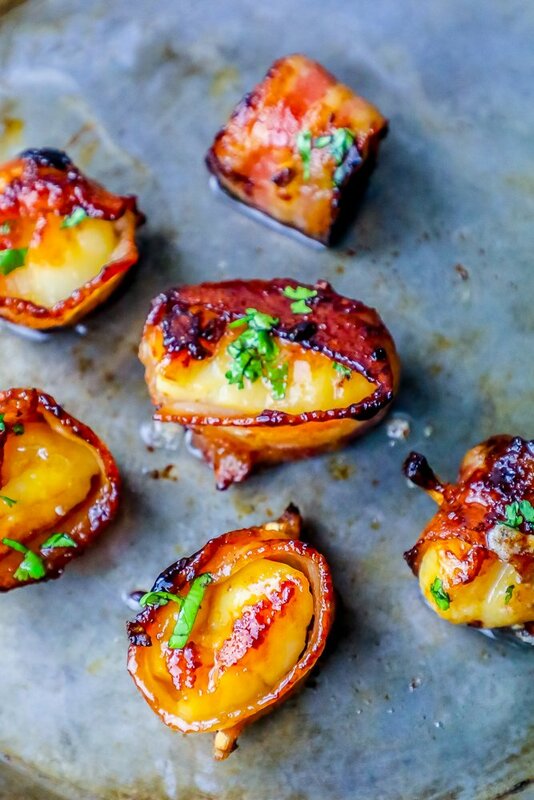 If you love these easy and delicious brown sugar glazed bacon wrapped scallops, you’ll love my other favorite scallop recipes! 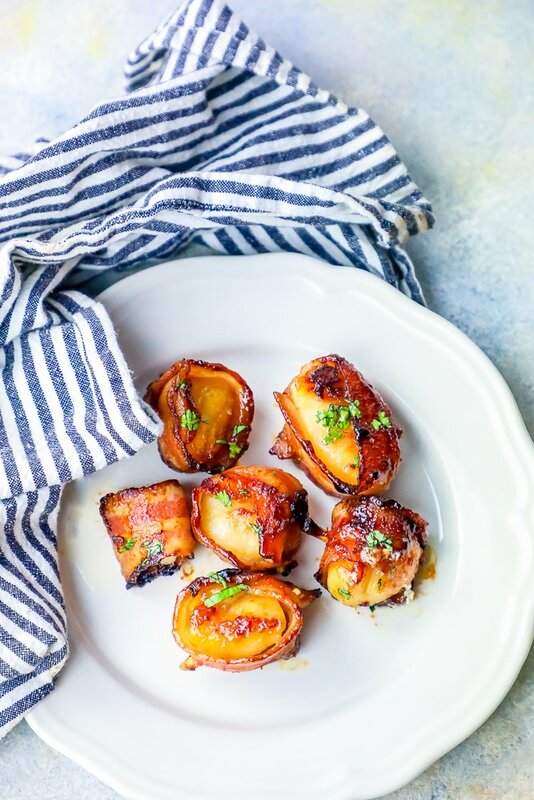 If you love this Easy Brown Sugar Bacon Wrapped Scallops Recipe as much as I do, please write a five star review, and be sure to help me share on facebook and pinterest! 4 strips bacon, *approximately - used 1/2 slice of bacon for each scallop. In a large pan, start to crisp bacon. Cook bacon until golden brown - but still soft and pliable. In a small bowl, mix salt, pepper, and garlic and then sprinkle generously over scallops. Wrap each scallop with 1/2 bacon strip and secure by pushing a toothpick through the bacon and scallop. In another small bowl, mix brown sugar and ginger. Sprinkle brown sugar and ginger mixture all over scallop, but reserve much of the sugar and gigner to sprinkle after the scallops flip once. Heat butter in large pan until foamy and melted. Add scallops to pan and cook on medium high heat. Flip after 5-6 minutes, sprinkle with more sugar and ginger, and continue repeating steps until scallops are cooked. These are the best appetizer! Everyone always loves them! These are so awesomely yummy! I’m always ready for anything wrapped in bacon! The ultimate flavor combo!! These are the best holiday appetizers! Everyone loves them! Scallops are my absolute favorite seafood. This recipe is perfection. They turned out perfect! Loved it simple easy and delicious!